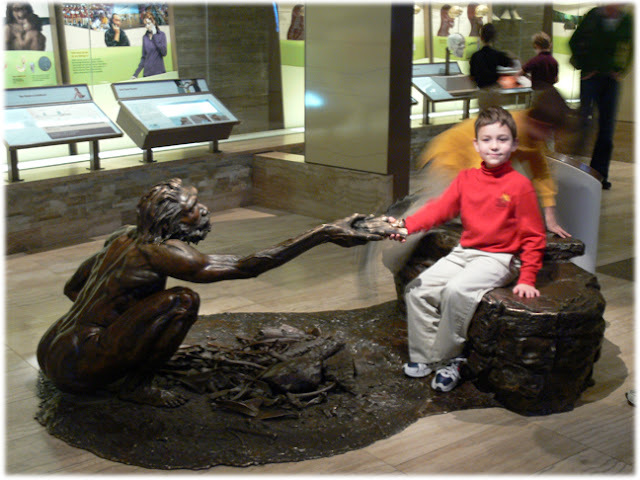 Yesterday I got to chaperon my son's second grade class to the Smithsonian's Natural History Museum. The class is studying various periods of the dinosaurs, so after the kids got all their classwork done, we all split into groups and explored the museum. 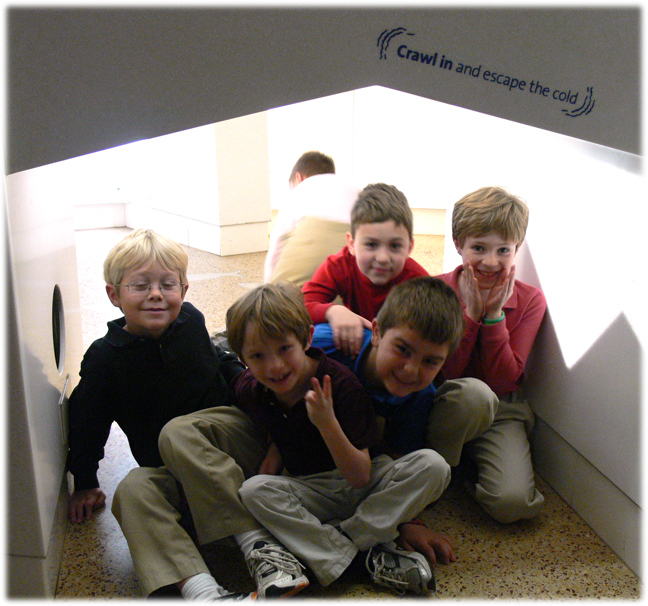 As a family, we've all hit the various museums of the Smithsonian frequently and with fervor. 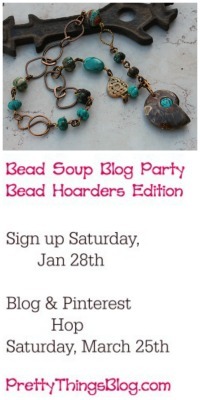 We're all about that sort of thing. But there's always something new to see, and seeing it with friends makes it much more fun! On our way out, Zack said hello and thank you to Prehistoric Man. 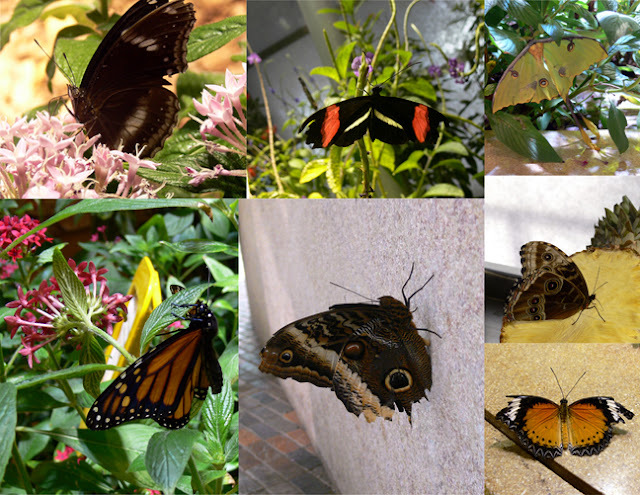 and then we all went into the butterfly exhibit, where real butterflies flew about us. They did include a couple of luna moths among the butterflies, so I finally got to see one in real life. Gorgeous. (I think you'll get a bigger picture if you click on it. I think). 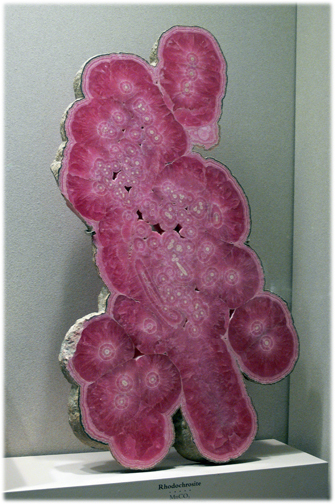 and an exceptional specimen of Argentinian rhodochrosite, which was between three and four feet tall. 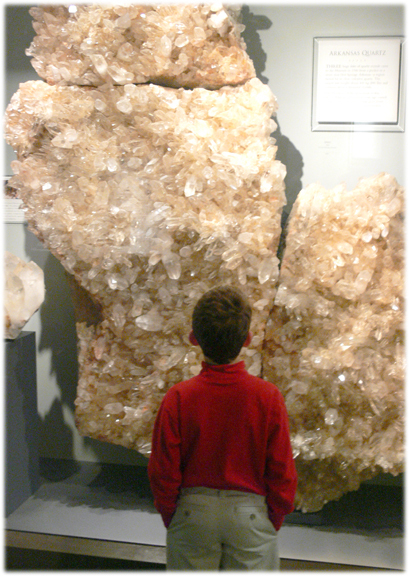 Then Zack got stopped in his tracks by an enormous wall of quartz. 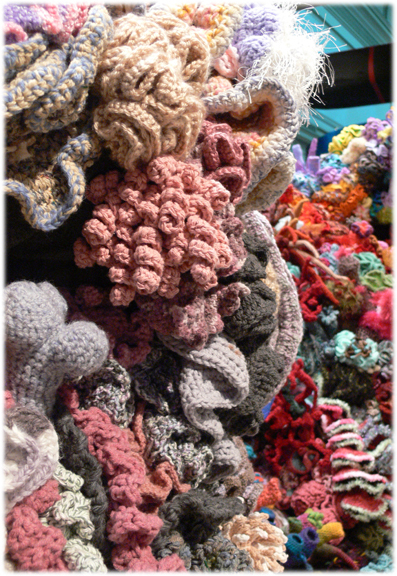 By far, my favorite special exhibit was the Hyperbolic Crochet Coral Reef. 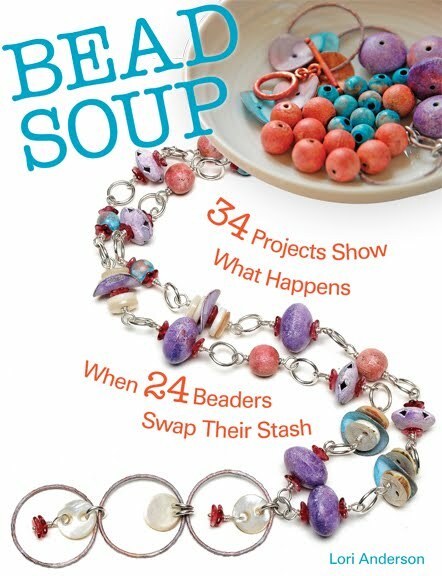 I'd read in the Etsy Forums about a few artisans participating in this HUGE project (taller than two of me, at least, for the main exhibit), and if you click the link above, you can learn how to contribute, how to learn to make things like this, and more about the project. 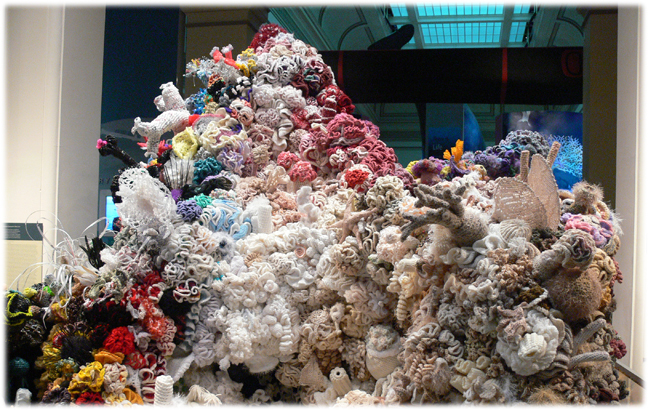 In a nutshell, it's an enormous coral reef made mostly out of yarn. Please forgive my photos -- the lighting wasn't with me. But enjoy. Wonderful photos! That coral reef is quite a sight! I can't even imagine what it must have been like to see it in person! That coral reef is insane! I love it! Also, I want to eat that piece of rhodochrosite - amaaaazing... I hope to get to the Smithsonian some day. I remember when it was just a small art project in a window in New York... it certainly has grown! I love the reef! What a wonderful project. We haven't been to the museum in probably 12 years. Time to go again. Wow - that is so cool. Both mom and I want to go to the Smithsonian some day. 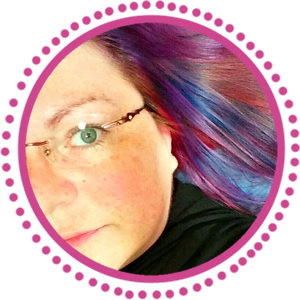 I would love to see all the things you just posted. 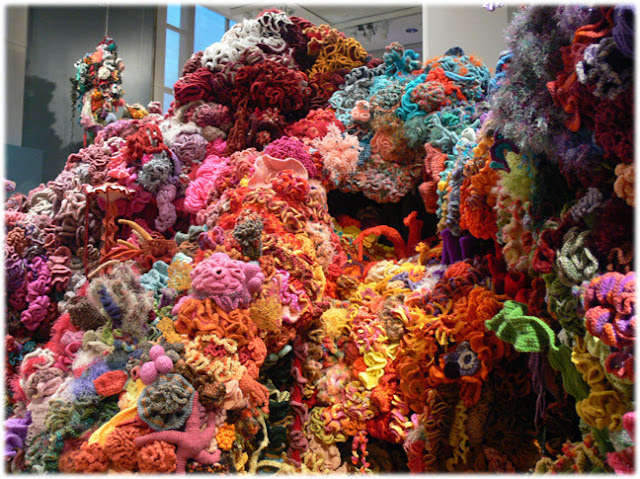 Love, love, the crochet coral reef, that is so cool! What an amazing day! 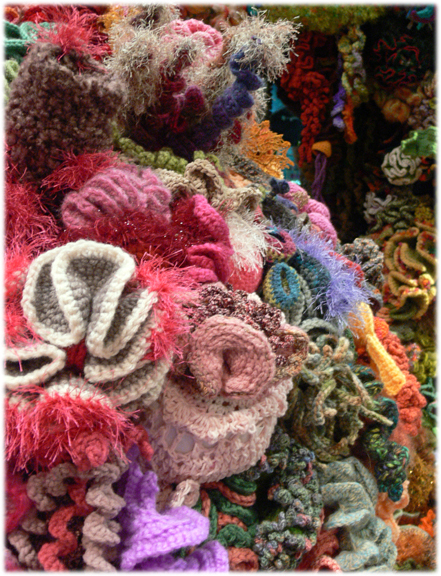 I love the fibre coral reef and am inspired now to make some beads using the colours and textures in those photos. The crystals look amazing - I could spend hours in a place like that just drooling over nature. 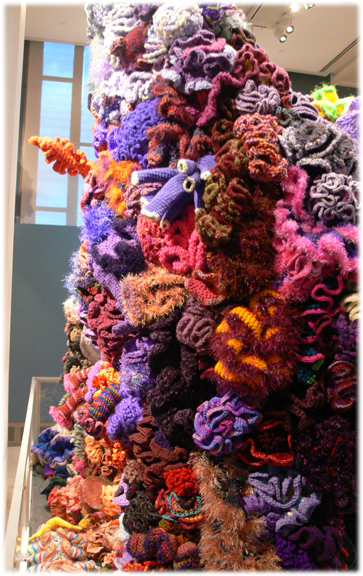 The yarn coral is SO cool! Wow! I wish I could go there! How fun! 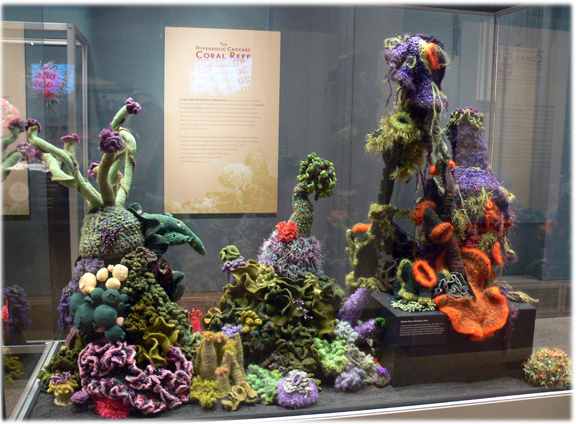 I love the crochet reef! 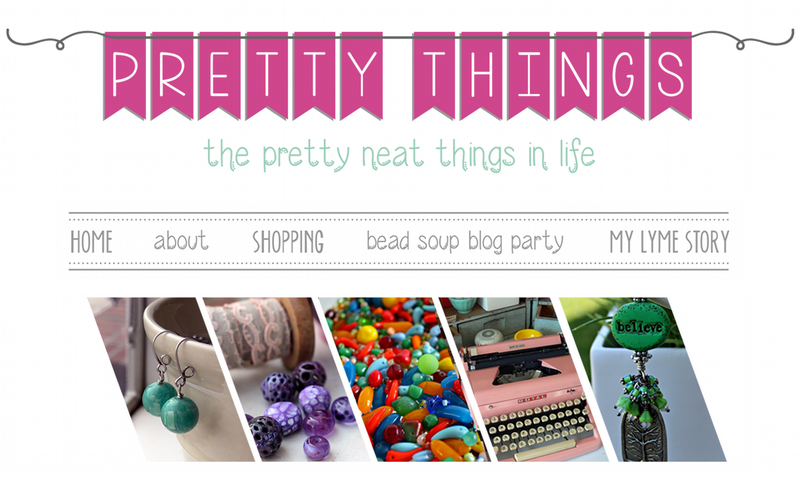 What a lovely blog. Don't you just love 2nd graders. Ther are old enough to teach yet not old enough to be smarty pants.and they think you are wonderful. Lori - what a GREAT photo tour of the museum! When Jackson was a baby thru toddler we lived literally just up the street from that museum and visited often (and the others too)! Now we go only a couple times a year, and love it every time. Looks like a fun visit! Looks like you had some fun. The pics were great. I just love that coral reef! Enjoyed the tour, thank you. I stopped by to see the Hope Diamond this summer and it was so crowded. Just got close enough to see it and then moved on. Hope to get back there some day soon. Thanks for sharing! The Coral Reef is amazing! That is just so dang cool! Some people have such enviable talents. Working with thread and yarn is one of my envies. Thanks for sharing and for showing us what a fun day with mom is like! Beautiful photos! I love the colors in the coral reef. This is a visual feast! This is a wonderful field trip and I think that the education outside the class room is one of the best educations our children can receive. Oh my gosh, that coral reef is incredible. Such vivid colors! Love the Coral Reef..now you make me wannat take a drive up. It's been a few years since we've been to the Mall. One can never see the museums too many times, especially if you're close by. Wow, those gemstones are incredible! What a fun trip. The "coral reef" slayed me! 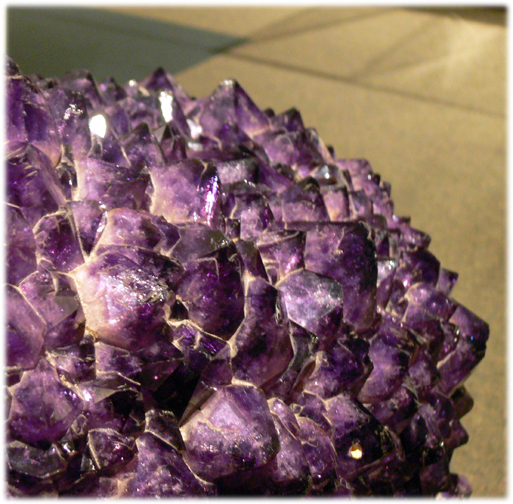 And that amethyst! And those butterflies! What a wonderful way to spend your day with growing young minds and beauty all around you. I love this coral reef!!! I love the coral reef! And those sea shells! Thanks for the trip. Yes, thank you for the great photo tour! I visited several of the Smithsonians while visiting Washinton D.C.
And now I know that there are not only lots of crazy beaders, but also lots of crazy crochet people! Thanks for sharing! I love going on field trips with my kids. It looks like you had lots of fun!!! You have brought back the most precious memories of trips my son and I used to take to the Planetarium in Miami. Thanks so much for sharing your day. Sounds like you all had a great time. The pictures are so cool. I would have started hyperventilating when I say the wall of gemstones. 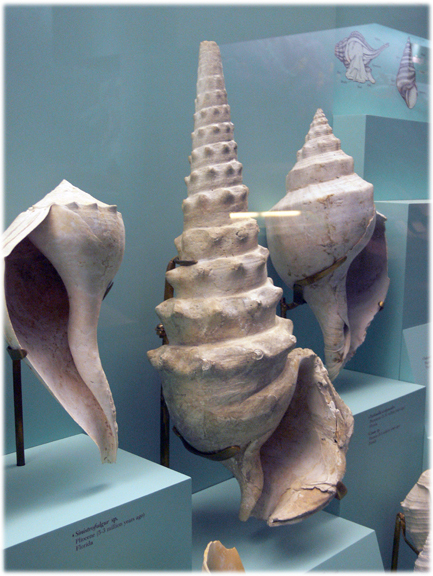 And seriously, the sea shells what crawled out of them? Lori, you were right in my back yard! I love the Smithsonian and I think we're due for another visit. I especially like your picture of Zack with the prehistoric man, studying the quartz wall, and the coral reef project - wow!!!! What a fun-filled (and exhausting) day full of new memories. oh my goodness! This makes me want to hop in the car for another roadtrip! Definitely need to plan one to see all of this, very interesting! 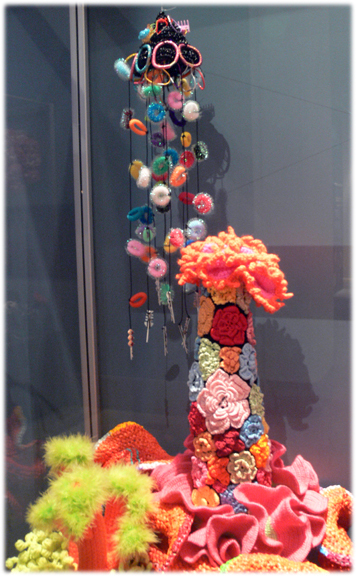 Oh my... this crochet work is amazing!! Thank you for sharing this kind of things with the world!